WAIST HIGH: PiL's U.S. Tour Will Fund New Album. PiL's U.S. Tour Will Fund New Album. From Slicing Up Eyeballs: Punk icon John Lydon hopes to use the proceeds from Public Image Ltd.'s upcoming U.S. tour to fund the recording of the reconstituted band's first new album since 1992's That What Is Not, the singer tells billboard.com. New PiL sessions likely "will come at the end of this. That's definitely my intention," Lydon says, referring to the reunion that began with a spate of U.K. shows last December and continues with North American concerts beginning with the band's April 16 appearance at the Coachella Valley Music & Arts Festival. "The only way we can make money is the touring, and then we can make a new album," Lydon says. "It’s sort of like the old days of PiL, when the Pistols went kaput; I had to scrimp and scrape out of my own pocket. Not much has changed." Lydon says the new album likely will be recorded in the U.S., and possibly at his new home studio in Los Angeles. 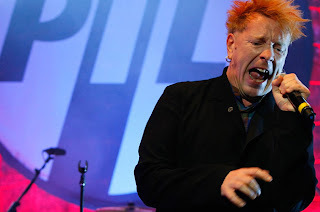 The frontman, however, says PiL won’t try out any new songs during its upcoming tour. PiL is currently John Lydon, Lu Edmonds, Bruce Smith, and Scott Firth.